Some hunt for treasure (pirates), others for true love (lonely pirates), and still others for…THE EXCEPTIONAL CUP OF COFFEE. And Dan and I have found what we believe to be one of the best so far (not Starbucks). Travel tip #694–I use urbanspoon.com to find local places reviewed by, yes, the locals. This is how I discovered Mo’Joe, a dark and “studious” coffeehouse at 222 W. Michigan St., walking distance from Indy’s Centre Circle. The wall of large windows does let in a lot of warm sunshine during the day, brightening the black ceilings. The clientele, which appears to mainly be very serious college students, makes me want to use my “library voice” when talking religion and politics with my husband. 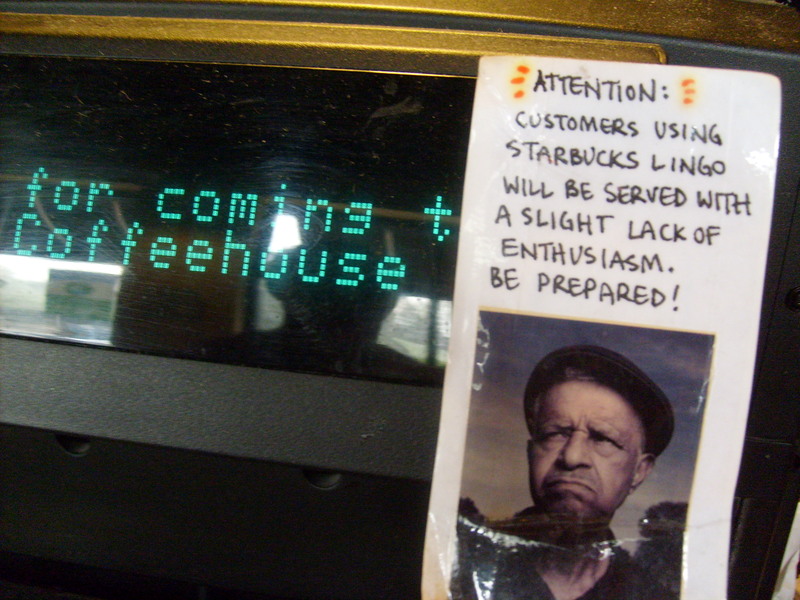 We ordered a regular latte–Dan hot, me iced. Unusual for us, because lattes usually taste more like milk than coffee. 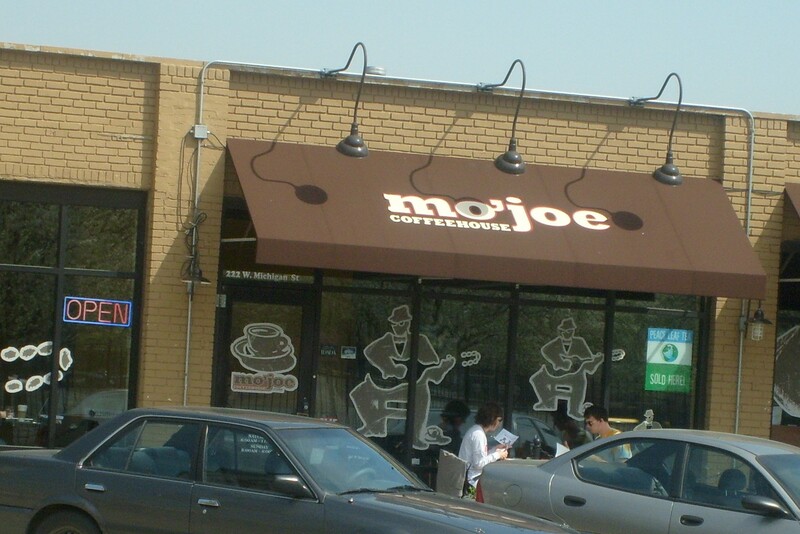 Mo’Joe’s is nice and strong. But just being strong doesn’t cut it. The coffee has a deep roasted flavor without any bitterness. 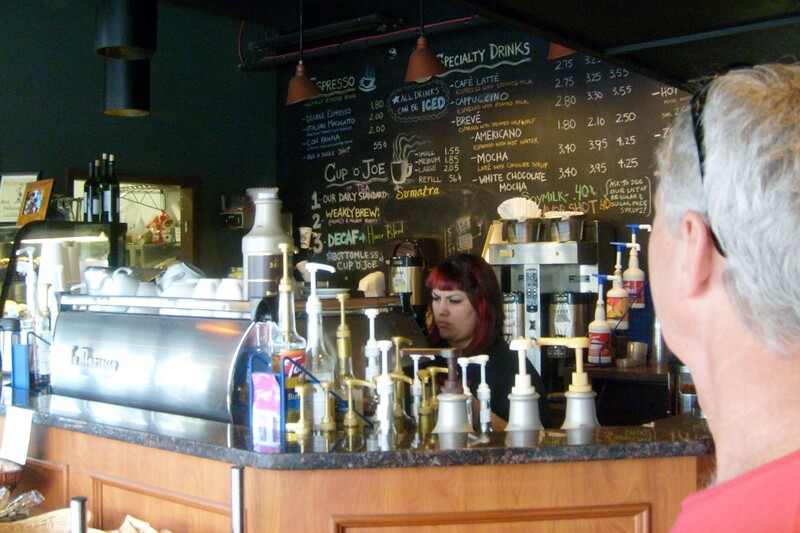 The beans are roasted locally by Julian Coffee Roasters. Add a bagel, which Mo’Joe buys from–Shapiro’s (see our previous post on this Jewish deli!). While you’re sitting there, pick up one of the used books to read…or to pretend you’re reading so you will also look studious. Not much here in the way of merchandise–what, no overpriced coffee mugs grinders brewers presses KD Lang and Roy Orbison CDs? 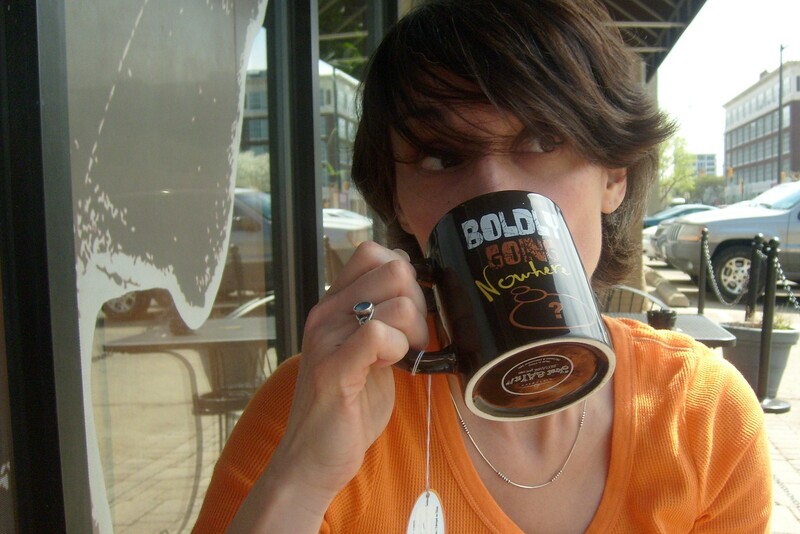 !–no, just this mug that we have decided is the first in our collection of mugs from favorite places. Boldy Going Nowhere -- I'm already there. ALL RIGHT! This visit we sat outside (still using my library voice) on the metal chairs that say “enjoy yourself but not for so long that you finish that 12-page research paper while you nurse one cup of coffee.” The outdoor seating is only for the sake of fresh air as the pots full of weeds don’t do much to section off the edge of the parking lot. This is a strange couple (by that I mean 'not us'). I love this post. One day it is my dream to do a coffee house road trip in search for an amazing cup of coffee. And I couldn’t stop laughing when I read the no starbucks lingo sign. Oh and your hair looks great!